One of a commercial roofing system’s most critical components is its gutters. Unfortunately, too many business owners ignore their gutters, which can compromise their roof and building. 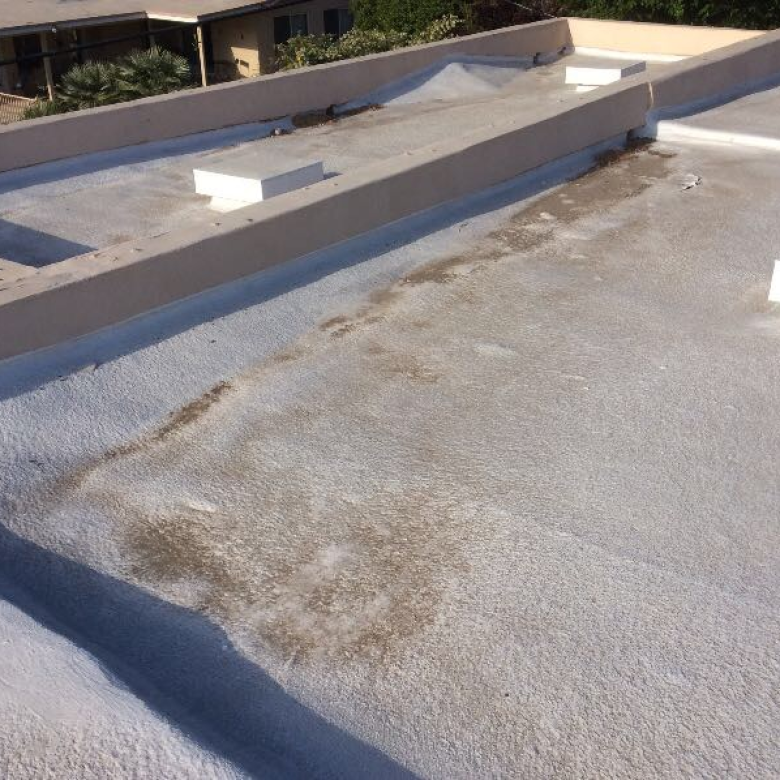 If you have a flat commercial roof on your building, it’s imperative that you keep your gutters clean and properly maintained. 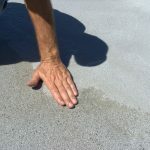 Here are a few basic guidelines for cleaning and maintaining gutters on a flat commercial roof. There are several risks linked with failing to clean and maintain your rain gutters. For example, because gutters and downspouts are constructed for directing rainwater away from a building and foundation, when they become overloaded from leaves and other debris that cause blockage, they can break away from a building. As a result, flooding occurs from water that cannot properly flow down the spout. Then, water spills over, flooding a foundation. This overflow of water can even flood a basement. Another problem is a cracked foundation, caused from cracks forming from water that spills over the clogged sides of gutters. The water then leaks into a foundation and can freeze. 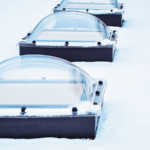 What’s more, ice dams can develop, in which water freezes inside clogged rain gutters. As ice pushes against a flat roof, wood rot can occur. Furthermore, the exterior of your building can be stained from water spilling over the clogged gutter’s sides. Wear shoes that are sturdy and dress properly by using rubber gloves, safety goggles and wearing a long-sleeved shirt. Use an extendable ladder—Ladder “horns” or standoff stabilizers can help in protecting your ladder from damage. It’s a good idea to take a plumber’s snake for unclogging stubborn clogs in downspouts. Have a plastic bag or bucket to carry your tools, using an “S-hook” to hook your bag or bucket to the ladder. In other words, don’t carry sharp objects in your pockets, such as trowels, when climbing a ladder, because if you fall, you could be injured. Remove all slime and goo, using a plastic scoop. If you don’t have a plastic scoop, a toy sand shovel works well. A garden hose is also ideal for detecting leaks in gutters. Use a hose to flush out the muck. If the water has a hard time draining, inspect the downspout strainer for any clogs, rinsing the gunk off, if needed. Protect your grass by having a plastic tarp covering the ground. Maintaining your gutters is just as important as cleaning them regularly. If you find leaky gutter joints, use gutter sealant to caulk the joint on the inside of a gutter. To patch larger holes, use a patching kit, which is sold at most hardware stores. If you can’t find one, you could use metal flashing. In order for water to flow correctly, your gutters must be pitched toward downspouts. To determine if your gutter is properly pitched, look inside the gutter after a rainfall, and if you see standing water, it’s not pitched correctly. While most gutters need to be cleaned at least once a year, gutters that are near overhanging trees should be cleaned every six months. Closely inspect the area where downspouts meet your gutter system because this is where clogs usually happen. Always clean clogged gutters following a major storm or after a windy day. If your building is in an area that’s prone to hurricanes, be sure that your gutters have gutter straps for anchoring them against intense winds. If you live in a region that’s tends to have wildfires, use metal, noncombustible gutters and downspouts. You’ll need to be especially vigilant to be sure your gutters don’t contain any debris that could be a fire hazard. Be sure any loose or removed pieces are tightened or reattached when you work on a downspout. It helps to install gutter covers made from materials, such as mesh or porous foam, so clogging can be slowed down. 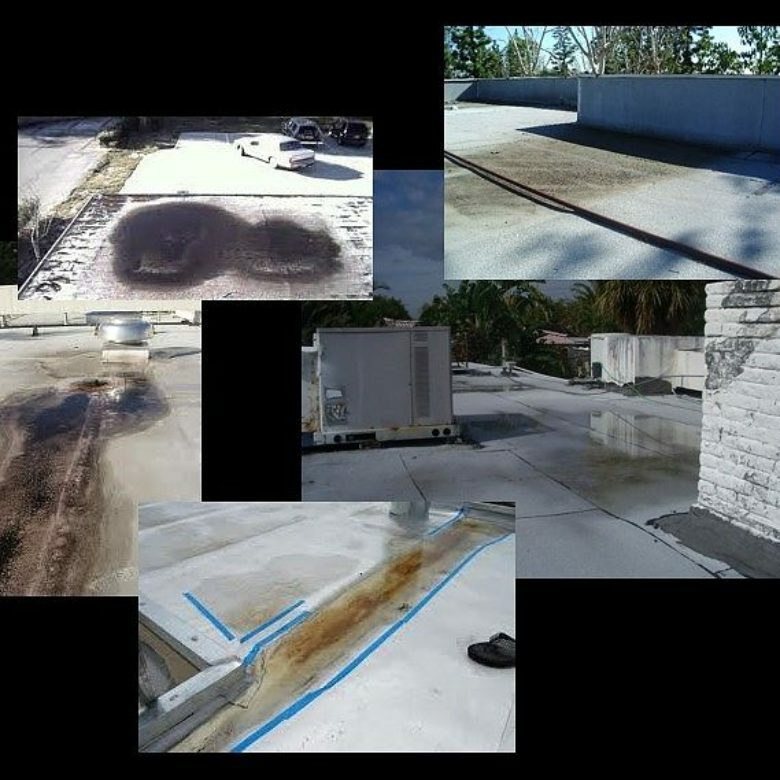 If you have a flat, commercial roof, it’s at risk for a common problem, known as ponding water, which is water that doesn’t evaporate after 48 hours, following rainfall. But this doesn’t have to be an issue when you use our exceptional RoofSlope product, which is formulated to fill in low spots on flat roofs. Please contact us and learn more about how we can help you prevent ponding water.